« ODBD June Release Blog Hop! For today’s Ways to Use It Challenge (WT430), we are to feature music and/or instruments. I went w/ the music as these are words from “America the Beautiful”. I’m still hearing the song every time I look at my card. The images are from Our Daily Bread designs. 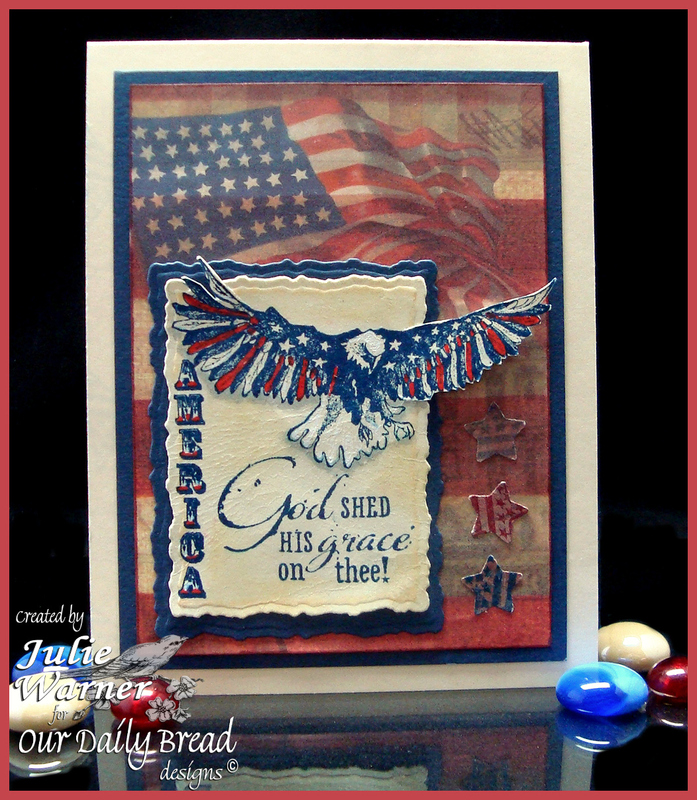 I love Patriotic cards and images and there’s nothing finer than the old red, white & blue. This card was fairly quick and easy. I cut a section of designer paper that included the flag and attached it on a navy blue layer. The eagle and musical sentiment were stamped w/ denim ink and colored w/ Copics. I die cut it using my Out of the Box Nestie technique using a Spellbinders deckled rectangle. With the die in place, I sponged a little antique linen ink on it. This was a left over piece of vanilla c/s and I think it must have been around a long time because when I removed the die, I noticed some fine cracking when I bent it. I kind of liked it and to me, it went w/ the distressed look so I used it. I added a few stamped & punched out stars next to it. The finished card is 4.25 x 5.50.